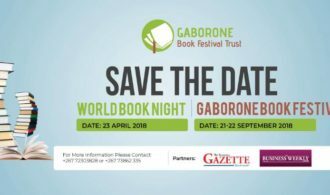 The first edition of the new Gaborone Book Festival 2018 is set to happen on September 21-22. The festival organisers are doing a trial run for their big event with a gig on World Book Day on April 23. Book Festivals by nature bring readers, authors, and thinkers of all ages and backgrounds together, united by their love for words and the book. They have been spreading across the continent in leaps and bounds as the need for writers and readers to commune has been realised. The latest of these is the Gaborone Book Fair 2018 set to happen in the capital of the Southern African country. The Gaborone Book Festival’s main mission is to foster a love for reading among Batswana and residents of Botswana. It will bring readers, writers, publishers, and thinkers together for inspiration, entertainment and discussion on key and light issues, to promote Botswana and African literature. The Trustees of Gaborone Book Festival Trust will organise book nights throughout the year to celebrate and highlight the literary works of Batswana as well as a main book festival. The build up to the festival is already underway. On the 1st of February which is World Read Aloud Day, GBF volunteers had a Read Aloud Drive at Camp Primary School, engaging over 600 students. The second round of the Read Aloud Activities will be at the first book night of the year at the University of Botswana Library Auditorium on April 23, 2018. The event will feature and celebrate Batswana authors Lauri Kubuitsile, Modirwa Kekwaletse, Kagiso Madibana and Thabo Katholo. Choppies Group of Companies is financially supporting the GBF Book Night, a mutually beneficial partnership the organisers are grateful for and looking to grow beyond 2018. Botswana Gazette and The Business Weekly and Review, two of Botswana’s leading media houses, are the Trust’s media partners for the book nights and the main book festival. Pingback: Gaborone Book Festival hosts World Book Day 2018 celebrations. Iam a South African short story author with 4 titles, the latest of which is Camdeboo Stories, a collection of short stories. I am one of the underground ANC guerrilas who operated in Botswana between 1985 and 1990. This is good. I suggest that you get in contact with the festival organisers on their social media channels.